Yet another untouched discography. 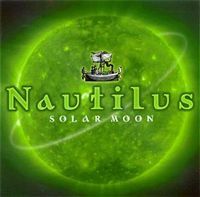 This is my first Nautilus, but I will later hear In Search of Castaways (2004) which the band info says to be the most interesting from prog's point of view. This one falls unquestionably into the beatful Electronica; more groovy, and even disco-ish here and there, than 80s/90s Tangerine Dream, not to mention numerous makers of serene music that can be labeled as New Age. This really couldn't. Have a look at the track titles and you get the image of the music's atmosphere. Welcome to the Sunny Side of the Moon! Let's have a happy trip up here! Actually it's the backside of the Moon you see in one picture, but the musical trip is careless and hippy anyway. Synths, sequencers, samples and electric guitars are our vehicles, all polished and greased up well. Many tracks extend beyond 6 minutes, the longest even 13:54, (and yet nothing seriously progressive) but the groove doesn't fail. Instead this music seems to give some energy while being a kind of hypnotic - though you better do something else too, while listening. Pretty nice 72-minute album in its field but totally "non-essential" for us progheads: 3 stars.